I'm not quite following you. You rented a box van to tow scampy, while you decide what tow vehicle to buy? Why not put your stuff in storage until you decide? Find a RV park and park Scampy. Does your insurance provide for a rental while Transito is deemed totaled? It should! Use that rental to go tow vehicle shopping! As for turning a box truck into a RV you're better off turning that transit connect into one. It will have better gas mileage and easier to drive. Tell me you're kidding. Wouldn't putting my stuff in storage mean that I would remain in Oregon for the winter? I rented the box van to tow Scampy to San Diego which is my winter hang-out. Wait and see pudding! You will have to wait and see to know the answer! Perhaps a class B. Something like a roadtrek easier to negotiate and maintain. You can always tow a trailer with all your tools. So, you are suggesting that I live in a class B RV. And tow my tools in a trailer? With Scampy and Señor Tránsito, I did the opposite. 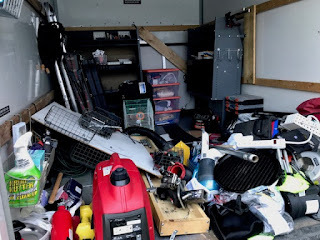 Stored my tools in my tow vehicle and lived in my trailer. Both of these options mean that two vehicles are required. Isn't that right? It was in response to you wanting to convert a box van. You will be limited with a class c or box van. Didn't know you rented the Uhaul to go one way. Thought you were looking for a tow vehicle immediately. Storage places are month to month so depending on what you decide...you can be on your way South before the snow falls. Sit,down, take some deep breaths and think some more. This is a bad idea. Why would you go,through all the time, expense and hardship of converting a box van when used motorhomes are plentiful and affordable? Plus, you'd lose an enormous amount of flexability. Right now you can disconnect Transito and have a reasonable size vehicle to go to town, take side trips, etc. I think replacing Transito with a better utility van is the right approach for this and other reasons. I do suggest the solar panels go on Scampy if possible to minimize the mods and maximize resale value of whatever tow vehicle. Thank you so very much for your input. Reader's advice is so valuable for me. Well, I did not see this coming either! Wow, a lot to process... So will the roll up door be your only means of access/egress? It won't be locked when you are inside. To me that would be the first thing to consider and if it's not enough security what would be my answer? Would the unlocked door at night tempt a thief and you inside asleep? What would I do. Frankly I don't have e an answer for that. Be interesting to see how you handle that issue. How about an access door in the side of the side of the box van? Would that do the trick? Good Morning George—yesterday I commented that I was feeling your pain. By that I mean that I commiserate with what you are going through. I know that you can convert the box van and make it as comforatable as Scampy is/was. You can do it George! I look forward to hearing all about your progress and I think you will be happier in the long run. Thank you soooo much for the confidence that you express about me in your comment. But, for right now, a box van conversion project is not written in concrete! Major undertaking? Yes, it is that! If I actually decide to do it. Converting a box van to an RV, will be the mother load of projects! Sorry, but I think that sounds bad. No windows, no insulation, cost of conversion. You’ll have to keep Scampy and get a van or get a C or A and get rid it of some stuff. Bad? Yes, it may be that! This is just my opinion, but the cost of converting a basic empty box is going to be expensive when you can just buy a small class B or C that's already done. You will be busy enough fixing, adjusting, changing the things that you want 'your' way in another tow vehicle. It's not that you don't have the ability, but why take up valuable time converting a whole box van when you can be traveling and piddling with your new vehicle? You have done a lot of work to Scampy to make it 'yours', The new tow vehicle will need enough changes/additions for your cargo. Good luck George, just think it through so that you get the right vehicle. Safe travels! I must think it thru. My suggestion is to keep looking, as transforming a box van into your RV is a serious undertaking. Windows, a door, appliances, etc. Many different options exist for you. Please take the time to analyze this decision. Converting a box van to be an RV, will be the major project of my life. More of a "brain-fart" than a "brain-stroke"
You behave as though being a jerk is the most wonderful thing in the world to be. You may think I am a jerk but I am realistic. You are TOO OLD to attempt a large project like this. Unless you continue to pull your Scamp to live in. I guess you could always just use the box truck as a hard sided tent. It did not work for Sarah Winchester and it will not work for you. George, Think about plumbing, tanks, heating, cooling, electrical, vents, windows, doors, steps and insulation. Do you think there is room to live and store all your possessions? Yes. In fact, there is more space in Big Van's storage than in Scampy and Señor Tránsito combined. Bahahaha Mr. Ed's comments...you know George too well. Maybe Ed does know me well. George, Two thing come to my mind. 1. Wouldn't driving the box van be like driving a small class C? 2. It seems like the back of the box van it up high for going in and out? Yes, maybe driving a Box Van is similar to driving a small class C. So? Right now, entering and exiting the back of Box Van is a bit of a stretch. However, that may be corrected in a number of ways. George, consider the effect living in a box truck, or using one to tow Scampy can have on how you're perceived by the authorities when youre stealth camping in a town or city. A well maintained Scampy and an unmodified tow vehicle gives the initial impression that you may be a vacationers passing through. Same thing for a well maintained motorhome like Miss Tioga. But doing a home-made conversion of a box truck puts you in a different category at first glance, lumping you in with the down on their luck homeless people who have taken to living in vehicles as a last resort and are creating problems in so many cities. The same holds true for towing Scampy behind a box truck - it suggests it's all that you have and you're carrying all you have in the truck. This removes the first glance assumption that you're merely on vacation and may lead to more in-town encounters like you had with the police a few months back. I suggest you look for a nice looking motorhome like Miss Tioga, only newer, or a stock looking van to tow Miss Scampy so you can continue to blend in when you're in a city. Otherwise you may have to stay out of town's, confining your camping to remote forest camps. If you want to research self-built conversions, Bob Wall's cheaprvliving.com and his YouTube videos under the same title can provide dozens of examples and interviews. And though it does nothing for your immediate problem, his January Rubber Tramp Rendevous is an opportunity to meet with hundreds of people who have made their own conversions. You'll find most of them eschew trying to camp in cities, preferring to stay in forest camps. I have more RV street camping knowledge and experience than nearly any other RVer. I've been successfully living in MsTioga and now Scampy for over 15-years. I may rightfully claim to have "Written the book of stealthy RV street camping." In other-words, I am The Man! Lou! No doubt, George! But your experience is entirely using stock looking vehicles that tend to give you the benefit of the doubt. I'm just suggesting a box truck can remove much of the camouflage that lets you successfully camp in urban areas without attracting attention. I totally agree with you that you 'wrote-the-book' on stealth camping. There will be a movie made about you one day! RV street camping yes, but a converted box truck is not an RV. Gosh! I just miss Ms. Tioga. There was a place for everything and everything was in it's place. She fit your "being neat" style. I remember when you would be on a Mexico beach and start a wood project; you would buy the materials you needed, pull out your tools from the outside storage bins, and go to work. I know Ms. Tioga was long; what was she, at least 36 feet? Somewhere, there is Ms. Tioga's "daughter." Her daughter will be smaller and not as long, but will have storage bins on the outside just like her mother, just not as many. Ms. Tioga and her daughter were and are geared toward a priority of your living a neat and organized life, not a high priority of your hauling a lot of "stuff." They put "you" ahead of "stuff." If you must haul SOME stuff, U-Haul makes a very, very small trailer to hitch to Ms. Tioga's daughter to expand your storage. As you know from reading my Blog for a long time, I really get a kick out of tweaking stuff. To tweak defined: To make minor adjustments. If you are serious, which seems in doubt (you do like to joke around), you might want to consider a small class c toy hauler. You have RV front and garage in back for your tools, etc. and can work on it to your heart’s content all the while taking your garage with you! The U-Haul box van that I am driving now has all the space I will ever need! And, this box van is only 20 feet long. Bumper to bumper! No motorhome that I know of has as much storage space as this U-Haul box van AND is only 20 feet long. Your comment is for two vehicles. One Class B van and a cargo trailer. My box van choice would be only one vehicle. A box van that would contain all of my tools and supplies and my living quarters as well. A box truck CAN be turned into a rv, but try not trade you unused trailer in for a small class c or b and forgo all the build and legal problems. I'm all in for the used Box Van idea. Have someone insulate and panel it for you. Add a window and 2 fantastic fans and you'll be saving tons of money vs.a RV". Consider the 14'. It's just as easy to drive and 40% more room.